Our Hive sticker design template is the perfect print marketing tool to create buzz for your brand. 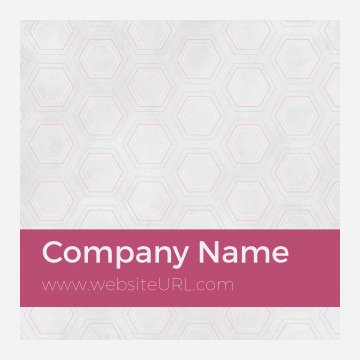 Perfect for any company that wants to strategically place stickers to increase brand awareness or package stickers in sales literature, shopping bags, and shipments, Hive prominently displays your company name and website URL in a strong solid-colored band backed by a honeycomb design pattern. Crafted by a pro designer, you can use Hive as a starting point to print custom stickers with five different color palettes, three different shapes, and our easy-to-use online design tool. Get started now! Custom sticker printing has never been so easy! Use our online design tool to turn any template into a branded masterpiece, personalized by you for your audience. After you choose your template, color scheme, and shape, the design tool makes it super-simple to personalize your text. You can even share your design before printing your stickers with a free downloadable PDF! PsPrint is the leader in affordable sticker printing, but that doesn’t mean you have to sacrifice quality. In fact, our premium paper stick and high-quality printing is highly-regarded by our customers – and your satisfaction is 100% guaranteed! Need custom printing? No problem! We’re here to make any sticker printing idea you have a reality. We also offer die-cut stickers, sheet stickers, envelope seals, window clings, bumper stickers, and even wine bottle labels!